A rare parasitic flower from South Africa puts out an entrancing smell to get local mammals to pollinate it. For the first time, these scents have been described, and we're starting to understand just why flowers smell so good. Cytinus visseri is a parasitic flower which — rather than producing its own chlorophyll — latches on to a host plant, and uses theirs. The bloom of C. visseri is usually hidden beneath bushes, and they're pollinated by nocturnal mammals who wouldn't be able to see their bright colors anyway. So how does the plant attract these critters? New research published the Proceedings of the Royal Society B has deciphered how this plant does it. 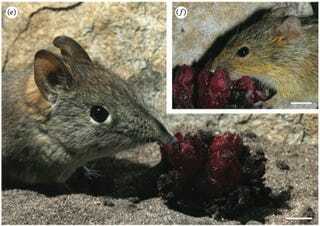 C. visseri is pollinated by small ground-dwelling mammals, like the adorable short-snouted elephant shrew and striped field mouse, shown above. In order to attract the night-time creatures, the C. visseri puts out two compounds: 3-hexanone, which is attractive to the rodents; and 1-hexen-3-one, which repels them when used on its own — however, when both ketones are released at once they're even more powerful. This is the first time a scent that is attractive to ground-dwelling mammals has been recorded.